When growing marijuana plants the male plants are undesirable, since they produce pollen to fertilize the female plant. This reduces the active desirable product. The plants are sexed after about two months prior to the pollen forming and the male plants are removed. About half the plants grown from seed produce males. Identification is relatively simple for males, since the pollen sacks are clean and in bunches along the branches of the plant. If seeds are required allow the males and females grow together. 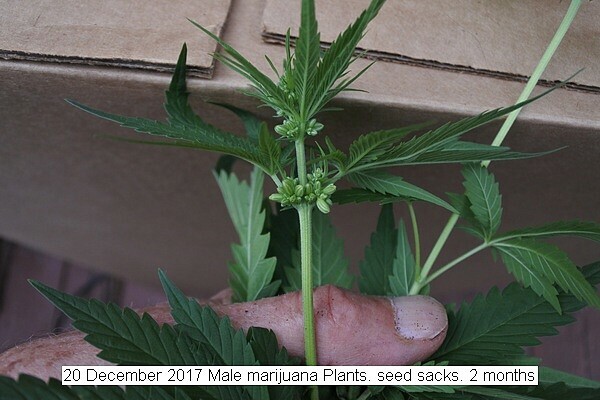 This entry was posted in Uncategorized and tagged 20 December 2017 Male marijuana plants, Male marijuana plants, Sexing male marijuana plants.. Bookmark the permalink.